This movie means a lot to me, partly because I’ve watched it repeatedly and also because it’s one of the few movies that has made me cry as an adult. In my defence, it was just after Valentine’s Day, I was single and I’d been drinking. Picking up where the first movie left off with crazy Riggs (Mel Gibson) and family man Murtaugh (Danny Glover) as wisecracking partners we’re launched straight into the tone of the movie thanks to the Looney Tunes theme and then a big car crash where Riggs and Murtaugh chase a bunch of blonde crims and uncover a mass of gold coins. The coins turn out to be South African krugerrands, which are illegal. 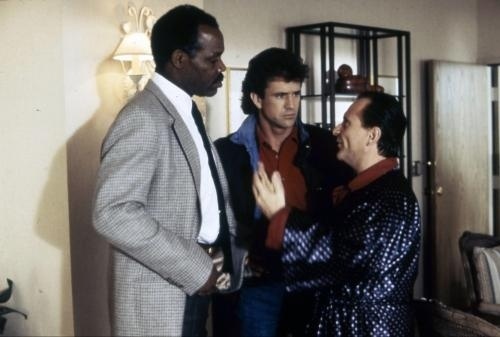 Riggs and Murtaugh dig into it a bit more, but are warned off by the South African consul Arjen Rudd (Joss Ackland) and his heavy Vorstedt (Derrick O’Connor), and reassigned to look after Leo Getz (Joe Pesci), a loud and irritating witness. Pesci fills this role wonderfully and with the heroes forms a fast talking, quipping triangle which delivers some of the film’s big laughs. Pesci’s character is annoying in places, but he should be applauded for softening as the film progresses. He gives Gibson and Glover someone extra to spark off, and fits well with the rapid fire, joke heavy dialogue. Of course, there’s plenty of this already thanks to the easy, natural feeling way that Gibson and Glover have Riggs and Murtaugh banter and bicker throughout, with the duo working together fantastically. Leo is targeted and the duo protect him, and realize that he’s connected to the South Africans. This is apartheid era South Africa, so they also hassle Murtaugh and are instantly unlikable. I think this reason, along with growing up learning about apartheid is part of the reason I’ve had a problem with South Africa and been unable to cheer their sports teams on, although now as most of their players are post-apartheid kids it’s not quite as strong a dislike. Riggs and Murtaugh then proceed to investigate and harass the South Africans, and Riggs woos Rudd’s secretary, Rika (Patsy Kensit), in a romantic subplot that is actually rather well done. It’s brief, but Gibson turns on the charm and his goofy, funny approach makes it easy to see why Rika might fall for him. The only problem is that during their flirting scenes Kensit’s South African accent clearly throws Gibson off and his Aussie side starts to come through a bit. Rika and Riggs get it on, but their happiness is short lived as their attacked and captured by Vorstedt. Vorstedt reveals that they’ve known about Riggs for a while, and that when he previously got too close Vorstedt tried to take him out, causing the car accident that killed Riggs’ missus. This doubles Riggs’ desire for revenge and escaping he teams up with Roger and they both go out for justice on the dastardly racists. Ackland is very good as the sleazy, menacing diplomat who abuses his power and diplomatic immunity to run his drug business, and the scene where a minor goon walks in to a plastic covered room is a nice touch. Ackland is the power and a hissable villain, but his right hand man Vorstedt is the physical threat and his tough one-on-one fight with Riggs near the end shows them to be evenly matched and has some bone crunching realism. It doesn’t quite match the Riggs vs Joshua smackdown of the original, but it’s pretty good. That brings us to the ending, which is an action movie masterclass. After Riggs takes out his man he’s dramatically gunned down by Rudd. Rudd then taunts Murtaugh with his diplomatic immunity, teeing Danny Glover up to deliver one of the best action movie post-kill lines ever. And then comes the part that made me cry. Already upset by the death of Rika, watching Murtaugh race to the fallen Riggs as “Knockin’ On Heaven’s Door” kicks in was all too much for me, despite knowing there were two more movies to come. This is down to the great directing of Richard Donner, who shoots it wonderfully. Apparently at one stage Riggs did actually buy the farm, but thankfully, they decided this was too much of a bummer and an injured Riggs lives to fight and quip another day. The impact of this scene is a sign of the movie’s major strengths, which is the way they build the relationship between Riggs and Murtaugh. They’re still very different and bicker away, but there’s definitely a sense that they know each other a bit better, sparking off each other and joking along. Riggs and Murtaugh- Best partners ever? There’s also more signs that their partnership is helping to soften Riggs’ and that he’s becoming part of the Murtaugh family, and this is one of the series major themes and biggest strengths, the redemption offered by simple human contact and interaction. 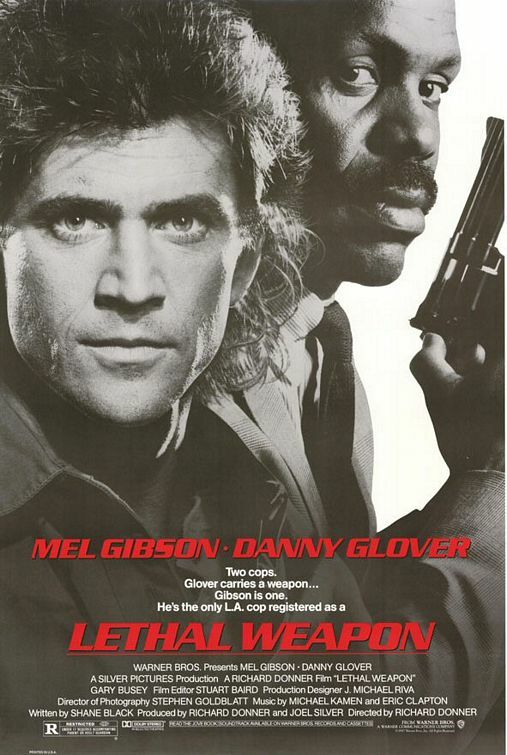 Glover is solid, dependable and likable as Murtaugh and gets the movie’s big moment, but Gibson steals the show, and is unbelievably charismatic as Riggs, a motormouth ball of energy who looks genuinely badass and crazy in places. This is one of the best examples of why Gibson was such a massive star, and he has the easy on screen charm that few stars possess, and continues to make Riggs a man crush of mine. The next two installments might not match the first two, but they’re still entertaining movies and Gibson and Glover’s chemistry continues throughout, making Riggs and Murtaugh one of the best buddy duos around. And this stands out as one of those sequels which builds on and strengthens the first movie, getting you even more involved in the characters and their adventures. The connection with Riggs’ wife is a bit heavy handed, and you can’t help thinking that with all their cop buddies dead along with Rika, and a threat to his partner’s family, Riggs has more than enough reason to go after the bad guys, but it still works and gives him the closure to move on in parts 3 and 4. There are a handful of movies that if I find them while channel surfing I’ll sit down and watch it until the end, regardless of how much I’ve missed or how recently I’ve seen it. This is one of those movies. Put simply I love this film. Its dated a little now, but it still remains one of the all time greatest action movies and the template for anyone who wants to write a decent buddy cop movie. The plot follows veteran detective Roger Murtaugh (Danny Glover) who is partnered with the reckless, unhinged Martin Riggs (Mel Gibson). They initially clash, with Murtaugh unwilling to trust Riggs and uncomfortable with the younger man’s wilder, more violent methods. 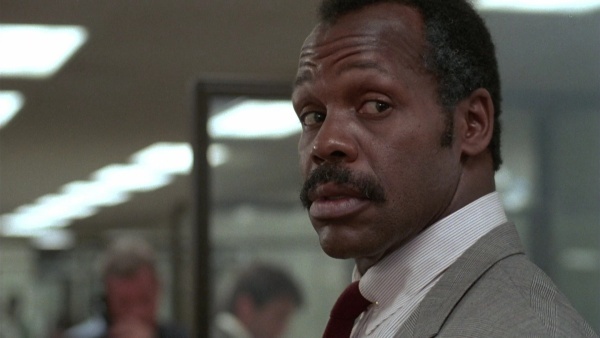 The two things they have in common are that they’re police officers and that both served in Vietnam, although it appears that while Murtaugh has managed to put this behind him, the former special forces soldier Riggs carries it more heavily. Riggs is also suicidal following the death of his wife which is why he has been moved to homicide to work with Murtaugh, as nobody wants to work with him in the drugs squad. They slowly begin to bond as they investigate the murder of the daughter of Murtaugh’s old ‘Nam buddy Hunsaker (Tom Atkins), only to discover that it may have more to do with what her father is involved in than her own actions. It transpires that Hunsaker has been working with other ex-officers who are using their contacts in Asia to smuggle heroin into the US. Hunsaker is killed and the duo find themselves in the sights of the group’s leader McAllister (Mitchell Ryan) and his psychotic henchman Mr Joshua (Gary Busey). Riggs is gunned down, but saved by his bullet proof vest, before McAllister’s men kidnap Murtaugh’s teenage daughter Rianne (Traci Wolfe). With Riggs believed dead they plan to rescue Rianne and take down the whole organisation, but are captured and tortured. Riggs manages to free himself and Murtaugh and they escape. 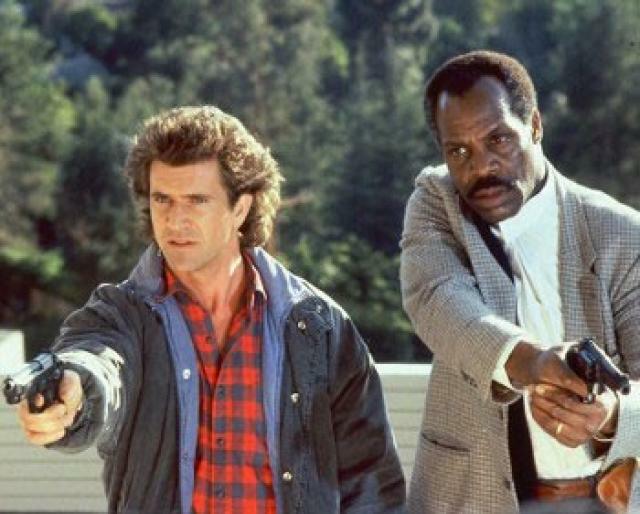 McAllister is killed by Murtaugh during the pursuit while Joshua heads to Murtaugh’s house where he and Riggs face off in a hand-to-hand fight on the front lawn. What makes this movie one of the best action movies is the brilliantly written script by Shane Black (The Last Boy Scout, The Long Kiss Goodnight, Kiss Kiss Bang Bang and Hawkins in Predator) which gives Gibson and Glover some great bickering dialogue filled with little one liners and gags. The two leads are also phenomenal, both individually, but mainly as a unit, with the two sharing great on screen chemistry. Sparring verbally and bouncing off each other, they manage to convey the initial mistrust both characters feel which is replaced over the course of the film by a growing bond and respect, creating one of the all time best duos. Glover is great as the world weary, aging Murtaugh, making the character believable as someone who’s quite tough and able to handle himself but tired of violence and killing, and reluctant to do so. The scenes between Murtaugh and his family have genuine warmth and he captures the everyman feel of the character, a reluctant but noble hero. Murtaugh is initially skeptical of Riggs until he realizes that his new partner is legitimately suicidal, at which point, while he’s far from happy with the situation there’s a sense of sympathy for the younger cop and a desire to help him. 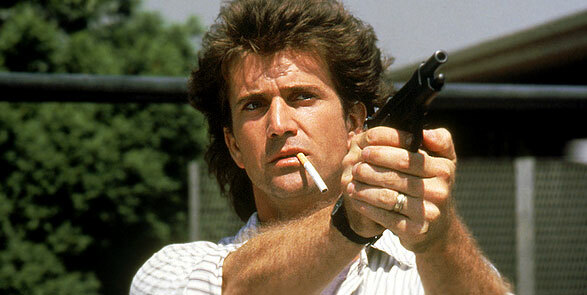 However, it’s Gibson’s movie, with Martin Riggs being one of his most likable and coolest characters. We’re introduced to him as a drinking, grieving mess of a man, drowning his sorrows over the death of his wife. There’s an extremely powerful scene where he puts a gun in his own mouth but can’t bring himself to kill himself, which makes him even more upset. There’s a sense as well that while he enjoys the fighting and action, possibly because as he says “it’s the only thing I was ever good at”, he also places himself in harms way because being killed in the line of duty would be “a good death”, with no shame involved. As the film goes on this self-destruction impulse seems to lessen as he becomes more focused in stopping McAllister and his men. There’s also a sense that in his developing friendship with Murtaugh and the way he’s been adopted by his partner’s family could provide him with support and a foundation to rebuild his life, a theme that continues throughout the entire series of films. However, he keeps the almost unhinged intensity he brings to combat remains, most notably in the way he snarls and growls at his opponents. The scene where a brutally tortured Riggs bursts into the room, kills a mess of thugs and then roars “Who’s f**king next? !” is a high point in cinematic badassery. Gibson manages to land the balance exactly right, he’s a damaged, flawed human being but there’s also glimpses of the happier, charismatic man he was. Gibson is one of the most effortlessly charismatic film stars I’ve ever seen and here he’s at his best, creating a likable, engaging hero who’s a complete badass but also surprisingly vulnerable at times. The film is wonderfully paced and directed by Richard Donner, who may be one of the greatest filmmakers of all time. Donner manages to mix all the different sections perfectly, capturing the close-knit Murtaugh family in a way that’s quite realistic and avoids cheesiness, as well as the sadness and despair of Riggs’ home life. There’s also the wonderfully 80s score which punctuates key moments and scenes with flourishes of saxophone or guitar stings. 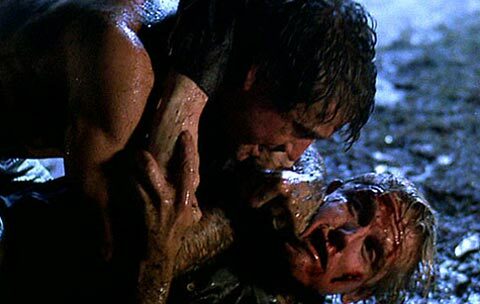 The action sequences are well handled, especially the bruising final brawl between Riggs and Joshua, as a broken fire hydrant rains water down on the two combatants and Murtaugh holds back any intervention and cheers for his partner (a scene referenced in Hot Fuzz). The final fight is this great, chaotic brawl and Busey’s Mr Joshua is the film’s real villain, with Busey making the character a coldly menacing and deranged heavy, like a dark version of Riggs. 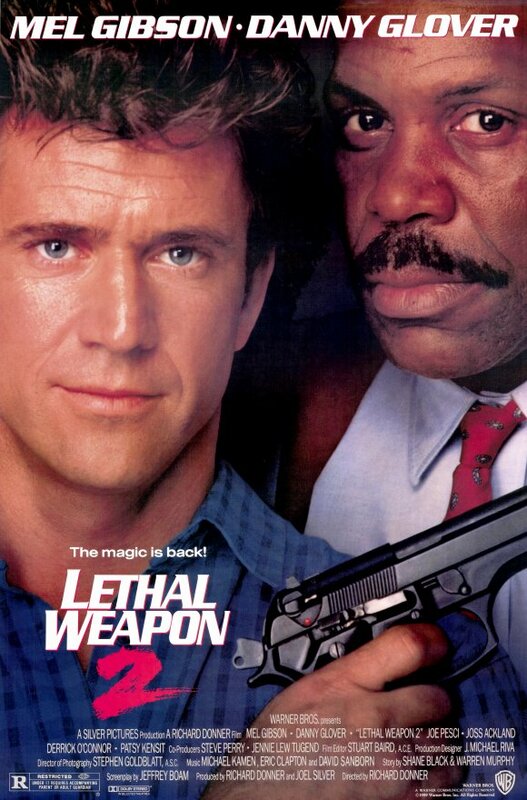 Its a hugely entertaining buddy cop adventure with a solid plot, some great dialogue and two brilliant central performances which establishes Riggs and Murtaugh as one of the all time best partnerships on screen. They were bound to come back again, but that’s a whole other blog.